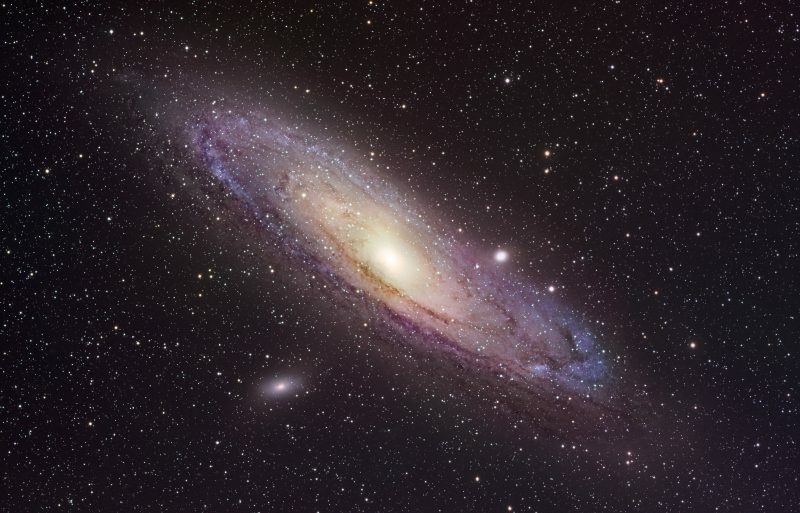 M31, aka NGC 224, and more commonly known as the “Great Galaxy in Andromeda”, is usually considered the farthest object (2.5 million light years) visible to the naked eye (albeit only its bright core). Spanning about 3 degrees across the sky, M31 is as long as 6 full moons end to end! Variable stars in M31 allowed Edwin Hubble to deduce this so-called spiral nebula was much more distant than previously thought — not a denizen of our Milky Way Galaxy, but representing an entirely separate “island universe” of billions of stars. Takahashi FSQ 106N, SBIG STL11K, Paramount ME, RGB 3 hrs/channel, processed in PixInsight and Photoshop. Data acquired from MYHY Observatory in Pennsylvania during autumn 2015.